Towards the end of John the Cute’s race against Death, a race for the future of the Land of All Legends, John the Cute came upon the only bridge that led to the big city of Green Is In. On the bridge stood a Troll. The Troll stopped John the Cute. John the Cute looked around and saw that the bridge was the only way into the big city of Green Is In, which was the only quick way to the palace, where King Charming the Fourth lay dying. Going around would delay his journey by a week at the very least. “Ask your question,” John the Cute said. The Troll began to tell a story. Deep in the city of Green Is In, said the Troll, is a special tower, containing a hundred rooms, one on top of the other, that almost reach the sky. The building is a special building, designed for people such as yourself who might be seeking a wife. The building is called the Bevy of Beauties. Anyone who walks into the first floor of the Bevy of Beauties, continued the Troll, finds himself surrounded by dozens of beautiful women of all sorts and shapes. That person can then choose to court one of the beauties for a wife. If he likes the sum of her beauty and her character, and if she likes the sum of his beauty and his character, they can get married. However, that man has a choice. He can leave the women he has already seen and move up to the next floor. There he will find even greater beauties, who have faces like dolls and perfect bodies, standing in the middle of the room in a way that would seem most beautiful. Anyone can choose to court one of these women, or to move up to the next floor. There is a room full of even greater beauties. And so on, with each floor, up until the hundredth floor, where you will find the greatest beauty of all. However, there is a catch. The higher you go in the Bevy of Beauties, the less the women move. The women, you see, stand in such a way as to only be beautiful. The more beautiful they are, the more afraid they are of moving into a position that would make them slightly less beautiful, even for a moment. The higher you go, the less the beautiful move. At the hundredth floor, there is only one woman. She is a woman who is more beautiful than all the women in the Bevy of Beauties and all the women in the Land of All Legends. She stands frozen in the middle of the room, looking like a magnificent doll, and never moves a muscle. That is how much she wants to always appear beautiful. If you want to choose her, you will not be able to choose from the sum of her character and her beauty. You cannot learn anything about her character, since she does not move, and only talks to say ‘Yes’ or ‘No’ with her mouth closed. You will only be able to choose her, judging her beauty. “I choose freedom of character.” John the Cute was firm. The Troll nodded and blinked. Within that blink, John the Cute lost his cuteness. His face was now a cracked mask of the troubles he had seen. Greed and death and lies and temptation filled his cheeks with wrinkles and cracks, telling the story of his travels and of his life. John the Cute, now no longer cute, nodded, and passed the Troll silently. John the Cute nodded, and another wrinkle of worry was added to his face. He then turned around and continued with hurried steps. Every time a story is told in our world, the real world, exactly one million and eleven times, it becomes real in the Land of All Legends. It has always been so, ever since man began to tell stories. Thus, Death, whose story has been told billions and billions of times, existed in the Land of All Legends and collected souls. At the time of Death’s legendary race with John the Cute for the life of King Charming the Fourth and the future of the kingdom, four other Deaths existed in the kingdom, as well. These were: Hades, Satan, Kali, and Adroa. In the time of Death’s race against John the Cute, Death came upon Five Corner Hill outside the big city of Green Is In. At the same time, at that same instance, to each of the remaining four corners of the hill, there came Hades, Satan, Kali, and Adroa. Each of them had come to collect the others’ souls. All five Deaths climbed atop the hill. All five Deaths stared at each other. All five Deaths raised their hands. And then a battle began, the likes of which had never been seen in the Land of All Legends. For five days and five nights the five Deaths fought each other to a standstill. But after the fifth day, following the fifth night, four Deaths lay dead, and only Death had kept his soul. While the other four Deaths lay dead atop the hill, Death, the victor, lay on his back. He was still alive, but only barely. Most of his life has been sucked away from him, and he did not have strength to move. Over the next two days, cats began to gather atop the hill. Hungry, they began to nibble at the four Deaths. Since each cat has nine souls, Death stole eight souls from each cat that came atop the hill. In this way, Death kept the cats alive – this was not their time to go – but strengthened his own strength with theirs. After eight days of gathering the souls of eight hundred cats, Death stood once more. His strength having returned, he continued his journey for the palace, fearing that John the Cute may have the advantage now. This has been the blood-curdling tale of Death’s chilling battle with four other Deaths. Once upon a time in the big city of Living Out Loud, John the Cute saw a robbery. This was during the days of John the Cute’s now legendary race with Death, a race that would determine the future of the Land of All Legends. John the Cute entered the house that was being robbed and broken into, and saw beautiful woman grab jewelry from various boxes and put them in her big purse. John the Cute nodded. He wasn’t sure what she was saying was the truth. But she looked honest. “I don’t think you should do that,” John the Cute offered. “You won’t tell on me, will you?” Tammy the Temptress put her hand on John the Cute’s shoulder. Her face was so beautiful and her touch was so soft that it caused John the Cute to want to help her. “True. My arms are a bit tired, and all this jewelry is heavy. Maybe you can carry it for me?” As she said this, Tammy the Temptress put her hand on John the Cute’s other shoulder. Her face was so beautiful and her touch was so soft that it caused John the Cute to think she was helpless. As she said this, Tammy the Temptress put her hand on John the Cute’s cheek. And she was so beautiful and her touch was so soft, that John the Cute knew he was the one who had to help her. “Thanks,” Tammy the Temptress caressed his cheek again. She rested on the sofa, while John the Cute began to gather more jewelry. By this time, a policeman had been called by the neighbors and was fast approaching the house that was being robbed. Meanwhile, a shadow without a body walked by and saw the broken house. He looked into the house, and saw Tammy the Temptress tempt John the Cute. The shadow recognized John the Cute as the man who had freed him from the twins many years ago. And the shadow remembered that he owed John the Cute a favor. When the policeman approached the house, the shadow acted immediately. The shadow breathed in more and more air and grew to be twice as big as his original size. Then the shadow flexed all his muscles and grew to be even twice as big as that. Then the shadow bit his lips and thought very hard and grew even twice as big as that. By this time, the shadow had become as big as the shadow of a giant. When the policeman saw the shadow of a giant near the house, he ran away, never to return. The shadow continued on his way, sad that John the Cute had turned to a life of crime. When John the Cute gathered all the jewelry, Tammy the Temptress took her big purse, then hit John the Cute over the head with a big club. John the Cute fainted, and Tammy the Temptress put him on a carriage. John the Cute woke up on a carriage a day later, and discovered that he was now further away from the palace than he had been before. He understood the wrong he had done and had learned about the dangers of temptation. But even though he had overcome temptation and survived, he was now certain that he was a few more days behind in his race with Death. This has been the alluring tale of John the Cute’s first encounter with temptation. I’m serializing my fairy tale novel, Tickling Butterflies. 128 separate fairy tales come together to create one epic fantasy fairy tale. A new fairy tale ‘episode’ is published every Sunday, Tuesday, and Thursday. Once upon a time, in the big city of New Bigness, there lived a very special thief. The thief used to wait for people around empty street corners. When someone came, he would jump out and scare half their lifetime away. Then he would catch the lifetime that had escaped and put it in his magic bag. Later on, he would put on his special clothes and go to the market to sell extra lifetime to his clients. It was during the time of Death’s race with John the Cute, that Death walked into the big city of New Bigness. It was the thief’s time, and Death intended to collect his soul and move on to the next big city on the way to the palace, where he would shake the king’s hand. Death came to the thief at the market, just as the thief was setting up his shop. Before the thief knew what was happening, Death grabbed the thief’s bag with one hand, then shook his hand with the other. The thief’s soul left him at that instant, and he died. Death’s hand, the one that had grabbed and held the magic bag, began to sting almost immediately. All the half-lives hurt Death, even through the magic cloth of the bag. Death was not accustomed to life. Death tried to let go of the bag, but the bag was magic and the life in it would not stop clinging to Death’s hand. Death shook his hand and tried to pull the bag away, but the bag would not become unstuck. Death’s hand hurt and the life in it felt like a million and one stings. Death realized he must be rid of all the life in the bag in order to be able to let it go. He had to act quickly: Not only did he want the pain to stop, but he also wanted to defeat John the Cute in the race for the life of King Charming the Fourth. Death had no choice. He stood in the market and offered extra life to passersby for free. Death handed out extra life until all life from the magic bag had been taken. Then, empty, the magic bag fell from Death’s hand, and hurt no more. Death buried the magic bag and quickly continued on his way towards the next big city. This has been the petrifying story of Death’s short encounter with life. Once upon a time, in the big city of New Bigness, there lived Painter Pete, a poor artist. Painter Pete never had any money. He had a great talent for paintings, but no other talents at all. As a man with no talents, he could not get a job. He had to earn a living painting on the pavements near the markets. Passersby would look at the paintings, and some would give him coins. But the coins were small and their value even smaller. Painter Pete’s dream was to get enough money to buy the specialized pavement brushes that would allow him to paint the best and most amazing paintings the world has ever seen. But specialized pavement brushes were quite expensive. One day, during the days in which John the Cute raced Death to King Charming the Fourth’s palace, Painter Pete found a golden coin in a ditch. Upon a closer look, Painter Pete realized it was a magic coin. Its magic was special: Whenever the coin was sold, it would suddenly become more golden and more valuable. John the Cute, being big of heart, agreed to listen to Painter Pete’s scheme. Once he listened to it, he agreed to help Painter Pete. John the Cute agreed to buy the golden coin from Painter Pete. As he grabbed hold of the coin, the coin became more golden and shinier. Painter Pete then agreed to buy the golden coin from John the Cute. When Painter Pete grabbed hold of the coin, the coin became even more golden. John the Cute then agreed to buy the coin from Painter Pete, then Painter Pete agreed to buy the coin from John the Cute, and so on many, many times. Money never exchanged hands, since they only agreed to pay, but did not actually pay. Only the coin changed hands. After fifteen times, Painter Pete held in his hands a coin worth two specialized pavement brushes and food for his family for six months. Painter Pete, now no longer poor, was happy to have achieved his dream. John the Cute began to continue walking, but Painter Pete stopped him. John the Cute was not able to resist the painter’s argument and agreed to do so again. After sixteen more back-and-forth exchanges, Painter Pete now held a golden coin that would allow him to buy food for his family for the next hundred and one years. Painter Pete laughed with joy. John the Cute began walking once more, when Painter Pete stopped him. After sixteen more back-and-forth exchanges, Painter Pete now held a golden coin that would allow him to buy anything he ever wanted whenever he wanted it. But now, all he wanted was for the coin to be worth more. He asked John the Cute to go through the process again. “But why?” John the Cute asked. “Why is it not enough?” John the Cute did not understand. John the Cute turned around and walked away. Painter Pete struck John the Cute from behind, knocking him unconscious. Painter Pete then put him on a carriage, so that when John the Cute woke up he would be far far away and unable to steal Painter Pete’s coin. John the Cute woke up on a carriage a day later, and discovered that he was now further from the palace than he had been before. He had faced greed and survived, but he was now behind in his race with Death. This has been the poignant story of how greed caused John the Cute a severe headache. This was said by a serious and powerful producer, who failed to see that by his logic, nothing new would ever get done. Problem: Producers find it hard to do something new. Producers really like projects that are the long the line of things that are already popular. What I write, however, is almost always experimental or new in some way. Conclusion: I should stay away from producers and their logic. I should just produce things on my own. Flashback: It’s six years ago. I’ve found a backer to back the horror series, I’ve held auditions, found actors and a crew, started rehearsals, and a production company has even started filming a documentary about the production’s unique journey. We were going to do the entire mini-series on spec (making the entire thing as a pilot), working under the assumption we’ll find one TV channel willing to take a high-quality finished product. Then the phone rings. It’s my backer. He’s transferred the first part of the money a couple of months ago. Today was the day he was supposed to transfer the rest of the money. But he’s decided to back out of the deal. A month before we start shooting, the production falls apart. I spend a few more months trying to find more backers before giving up. It took more than a year to work on a project that never came to be. Problem: My state of mind is a writer’s, not a director’s. This means that spending seven years chasing one project that may never be doesn’t sit well with me. I like to sit at home and spend that time on seven new books, plays, or scripts that will be %100 finished, because I’ll finish writing them, whether they get produced or not. I can try and get them published or produced while I’m working on writing the next project. Conclusion: I should stay away from projects that cost a hefty sum of money. How about projects that cost a paltry sum of money? Is that possible? Flashback: It’s four years ago. I walk into a children’s toy shop and buy a toy slate for $3. (A slate is the thing that snaps shut in front of the camera when the direction says ‘action’. It’s used to mark scenes easily. Its lack of use makes the editor’s job almost impossible.) I was about to direct an experimental feature-length SF film I had written. I’d found a way to avoid almost everything that costs money in film. The film had a budget of $25,000, and stuck to it. Low-budget means low-budget: I got our slate from a toy shop, and it worked just like a real one, except that it was more colorful. Conclusion: The film was made and premiered in Israel’s SF film festival, ICon 2008, which was great. Sure, having funds for your feature is great, but chasing backers does a body bad. Was there a way to make things for absolutely no money? There actually is a way to make a film with no money. Today, you’ve got cameras at home, so you can use those. If you use one-shots to shoot your film (meaning that you don’t ‘cut’ and shoot in one continuous shot), you can forego the editor and edit the film on your computers. If you happen to be able to shoot the film, you can cut out your DOP (‘director of photography’). Use actors that want to do something artistic just as much as you do. Write a story that uses the world itself, as it is, as the background, sets, and perhaps even lighting. So far, so good. My aim is to write something (hopefully amazing) and just shoot it, edit it, and release I to the world without any hassle in the middle. It looks achievable! The problem is that this time I wanted to tell the story of a massive science fiction epic: with superheroes, super villains, a showdown, a fantastic history spanning hundreds of years, and a story that spans many exotic locations. So: Can I do that for no money, please? The Greeks did it before, you see. It was around 2,600 years ago, when they created the theater. They told massive tales of fantasy, borrowed from their mythology (or, as they called it, ‘history’). These were tales of epic wars, gods’ wraths, journeys into mystical places, battles with monsters, and more. These tales were done without a Hollywood special effects team, and were still told in such a powerful way that the same tales are retold again and again through the generations, to this very day. Here’s the gist of it: If you put a few people in one location and tell the tale through their eyes, then there are writing techniques that will cause the story to be just as powerful and just as evocative as the best special effects you can muster. If. You do it. Well. So I wrote the script. It’s a 45-minute film for three actors. One character appears almost all the time and she is the character that talks. A second character also appears in all the scenes, but she does no talking whatsoever. A third character (a man, for a change,) appears only in the last two minutes. Through this structure I tell an epic tale about superheroes. The story spans hundreds of years and even has a superhero showdown towards the end, just like any other superhero script. 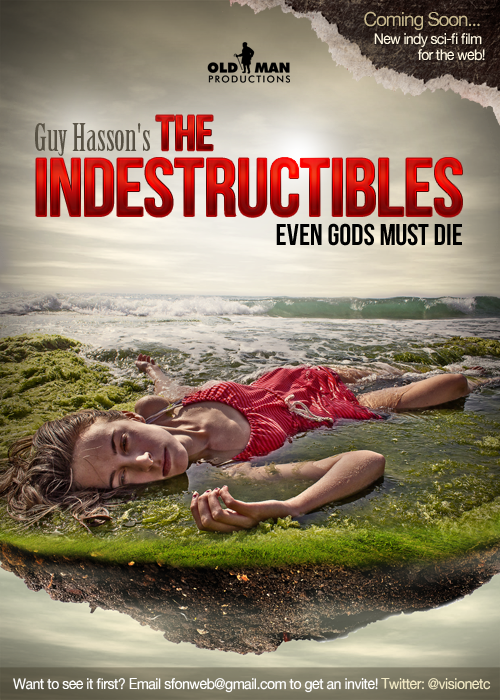 The film is called The Indestructibles. When we’re done filming, editing, and scoring, we’ll be spreading it in the most immediate and democratic way we have at our disposal. We’ll set up a website and put the film on that website as YouTube clips. The film will be constructed out of seven YouTube clips (shot in eight one-shots (see one-shot explanation above)). Since a forty-five minute YouTube clip is way too much for a YouTube format, The Indestructibles is written in a way that breaks it down into seven separate segments that follow each other consecutively. This is a personal project and this film journal is about a personal journey. I hope to share the journey and the adventure of creating something amazing (hopefully) with nothing more than a metaphorical gum wrapper and rubber band. Join me next time, as we cover the auditions. I’m serializing the fairy tale novel, Tickling Butterflies. 128 separate fairy tales come together to create one epic fantasy fairy tale. John the Cute journeyed towards the palace and Capital City, and in the first big city he entered, he met Death. John the Cute entered the City of Rats and its streets were empty and there was no noise about. John the Cute had never seen a big city, and did not know what to expect. But he did not believe this was normal. John the Cute walked in the empty streets for fifteen minutes, until he came across another person, dressed in black. “That is terrible,” John the Cute was shocked. “I am John the Cute,” John the Cute offered his hand. John the Cute’s eyes widened and his voice began to quake. “I must speak to the king,” he said. “I must shake his hand,” Death said. Death began to walk in the direction of the palace. John the Cute’s brow furrowed, and he did his best to recall such an incident. But he could not remember any such race within his short lifetime. When John the Cute looked up once more, Death was already gone from sight. John the Cute clenched his teeth and continued on his way towards the palace and the king. He went forward with great haste, hoping to beat Death in this race. This has been the chilling report of John the Cute’s encounter with Death and the beginning of the race for the king of the Land of All Legends. When John the Cute was eighteen years and eighteen days old, a royal messenger on horseback came into town and headed for the house of Kate the Tigress and her son, John the Cute. The king was sick and dying, the messenger relayed. In one of his last requests, King Charming the Fourth has asked for the presence of John the Cute. John the Cute was to leave his home for the palace in Capital City tomorrow morning. His message relayed, the messenger departed on his horse. Ever since John the Cute was born, Kate the Tigress had known the time would come when her son would leave her to be king. For eighteen years, she raised him on her own. For eighteen years, she taught him reading, writing, math, and values. For eighteen years, she had created a baby, a boy, a young man, and, finally, an adult. For eighteen years, she had prepared him for the life she imagined he would have. But when the decree came from the dying King Charming the Fourth, she was sad beyond words and cried until two wells were filled with her tears. On the evening before he would leave her, John the Cute wandered the forest in an attempt to find his mother a gift that would somehow lessen the sadness of his parting. So distraught was he, that he did not notice where he was going. Suddenly, he looked around and found himself standing at the bottom of a hill he had never stumbled upon before. Unbeknownst to him, that hill was called Burial Hill. At the top of Burial Hill, John the Cute saw the most beautiful and magnificent yellow flowers with orange streaks. Their beauty overwhelmed him and at the same time seemed familiar. He knew these flowers were the perfect gift for his mother. He plucked the flowers by the roots and headed back home, to give to his mother. Kate the Tigress saw the flowers and gasped. They were the most beautiful flowers she had ever seen and at the same time seemed familiar. Grabbing hold of the flowers, she smelled them, and the smell overwhelmed her. The smell was of a life she had had before John the Cute was born. It was the smell of the sweat of John the Cute’s father, Frank the Frank. It was the smell of the life they had had together. It was the smell of their True Love. The smell of the flowers engulfed her and hugged her. And even though she cried, the smell gave her strength. She knew that once John the Cute left, the smell of the flowers would comfort and hug her. The next day, when John the Cute left, she bid him a tearful adieu. Then, Kate the Tigress planted half the flowers in the garden. The rest, she put on her bed, so that their smell may engulf her when she rested and when she slept. This has been the happy tale of John the Cute’s departure from home, which led to Kate the Tigress’s surprising reunification with her husband, Frank the Frank. But this tale is not over. Kate the Tigress had known John the Cute would leave her to be king because of a prophecy she had been given nine months before John the Cute was born. John the Cute had known of this prophecy. He had known it, because his mother had told him of it. He had heard his mother quote the eight lines of the prophecy time and time again. But what John the Cute did not know was that Kate the Tigress had left something out. She had left out of the ten-line poem its last two horrible lines. Following the prediction of John the Cute’s death, these two lines told what would become of him after his death. It was a future worse than death in her eyes. These two lines she had vowed to herself never to reveal. In the darkness and emptiness that remained when John the Cute had left, she lay in her bed, engulfed in yellow flowers with orange streaks, afraid of what would become of her son. In the darkness and emptiness, the yellow flowers with orange streaks comforted Kate the Tigress, for they, too, knew of those lines in the prophecy.